Based on a True Story! 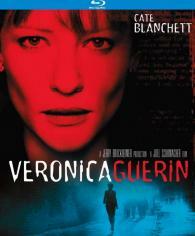 Cate Blanchett (Blue Jasmine) stars as Veronica Guerin in this action-packed, critically-acclaimed film about the real-life journalist who risked everything in search of the truth. In the mid-1990s, Dublin was nothing short of a war zone as the most powerful drug lords battled for absolute control. But their most fearsome opponent wasn't the police, it was the courageous Sunday Independent reporter Veronica Guerin. Investigating the criminal underworld meant risking her life… and the lives of her family. Joel Schumacher (Flatliners, Falling Down) directed this crackling suspense-filled drama with a top-notch cast including Ciarán Hinds (Munich), Brenda Fricker (My Left Foot), Gerald McSorley (TV's Omagh) and Colin Farrell (In Bruges).